﻿This course is designed to explore the fascinating world of sports and entertainment marketing. Throughout this course you will learn the basics of the marketing concepts in detail with the sports and entertainment industry. The Marketing Core Standards are﻿ distribution, marketing-information management, pricing, product/service management, promotion, selling, and financing. You will be able to define, describe, and apply these core standards to the fun-filled world of sports and entertainment. 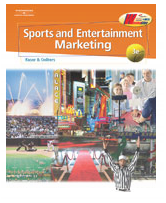 1 What is Sports and Entertainment Marketing? 10 Sports and Entertainment Promotion, Go to the wiki! After every unit you will be given a summative assessment which will test your knowledge of the unit material. This assessment will be based on all formative assessments that were completed prior to the end of the unit. You will be given a two-week grace period to make up any test missed due to absences. Should the test not be made up within that time frame, you may receive a zero. Should unforeseen circumstances arise, these issues will be discussed on a one-to-one basis. Depending on personal circumstances, students may be permitted to reassess their knowledge of the unit material by re-taking the summative assessment (no more than twice). Only students who achieve less than 85% will be permitted to do so. This reassessment may be in a different format but will assess student knowledge of the same unit material and will result in a grade no higher than 85% for the retake. It is your responsibility to complete all assignments by the time they are due. You will be given a two-week grace period to complete work after the due date. At that time, you will be assigned AA (Academic Accountability). If you do not attend AA or complete the work within that time frame., Saturday school may be assigned. If no effort to make up the assignments is demonstrated, you will receive a zero. It is also your responsibility to complete all work independently - any evidence of assignments being shared, copied or plagiarized will be given one more opportunity to complete the assignment ethically. It is your responsibility to obtain any assignments missed during your absence. Passes may be given for the Advisory period for makeup work. Arriving early or staying after school are also options. In both the business world and in the classroom, eighty percent of success is showing up. The other twenty percent of your success is determined by what you do once you arrive - productivity. Therefore, you will be expected to be in class every day, on time, and to fully participate in classroom activities.